The first thing that strikes you about this intriguing exhibition at Manchester Art Gallery is the darkness of Gallery 6, its Farrow & Ball-painted dark purple walls contrasting with the brightness of the preceding permanent exhibition rooms. This is designed to slow us down and creates the intimacy one might find in a Victorian study, allowing an examination of the illuminated art with minimal distraction. And a very Victorian exhibition this is: a bite-sized, visual narrative of Scotland as seen from the perspective of the Victorians (with the exception of two pieces of somewhat incongruous contemporary art), and one that is careful to present those eternal Scottish themes of tartan, mountains and deer in an understated way. Such prominent cultural reference points, it seems, were woven into the rich tapestry of the Victorian consciousness and transmitted to ours with more than a subconscious nudge from the great Sir Walter Scott, whose novels and poems were steeped in the waters of the Romantic period. Scott’s great talent was to fuse the Scottish landscape with its history, creating tales of yore which proved irresistible to industrious Victorians hungry for the escapism of the chivalric and for the idyllic, wild landscapes of northern Britain. It is well documented that Queen Victoria had a great love for Scotland, as her descendant Elizabeth II does today. Manchester’s wealthy industrialists, too, keen to own a piece of Scotland in a frame, amassed between them some fine examples of Scottish-themed art, which, fortunately for us, have found their way into Manchester Art Gallery’s collection. The 2014 referendum on Scottish independence isn’t far away of course, and is briefly referenced in the description of Ian Hamilton Finlay’s Roman-style inscription In Revolution Politics Becomes Nature. However, this is an exhibition which focuses on the artistic output of a Britain fully engaged with the ideal of union. Victorians north and south of the border did not consider Scottish culture as a barrier to economic cooperation. Indeed, it added a welcome layer of richness to the artistic and literary culture of the day, as illustrated by the magnificence of many of the paintings on display. Scotland, though, then as now, was never a nationalist backwater surviving off tales from a romanticised past. Underneath Scott’s folk-popularising of kilts and castle-adorned precipices, the Scottish Enlightenment had already seen great contributions made to western philosophical and scientific thought by Adam Smith, David Hume and Dugald Stewart, to name but a few – and union with England helped turn Scotland into a fully-fledged industrial nation. But David Allan’s painting Highland Wedding at Blair Atholl reminds us that the union hasn’t always been such a harmonious affair. It was executed in 1780 at a time when tartan was banned as a consequence of the Jacobite rebellion of 1745 (when English sovereignty came under serious threat from the army of Bonnie Prince Charlie). Despite this, the painting – here portrayed on a printed textile made in England between 1785-99 after the ban was lifted – is replete with defiant, tartan-wearing merrymakers. It’s as if Allan is expressing his artistic contempt at the distastefulness of such a decree. 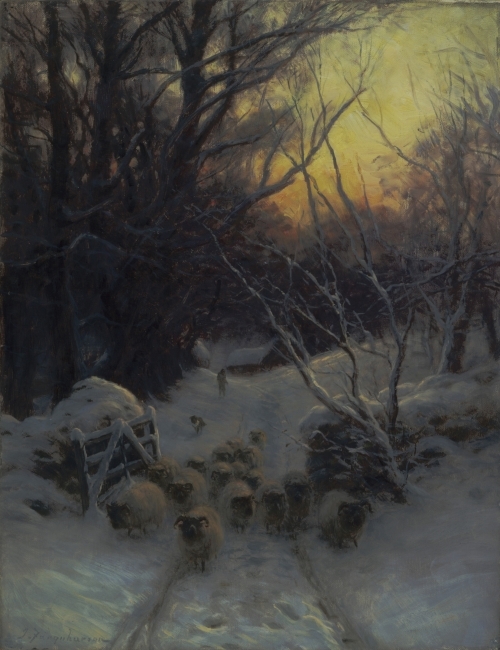 Joseph Farquharson’s atmospheric The Sun Had Closed The Winter Day (the first line of Robert Burns’s The Vision) depicts a crofting scene typical of the rustic Scotland of sheep and snow before the lamentable Highland Clearances of the 18th and 19th centuries. This process, which saw Scottish crofters forcibly removed from their land in order to make way for large-scale, profitable sheep farming, is often viewed erroneously as an English-driven policy, but was actually a product of the actions of Scottish landowners. Clan chiefs and nobles among them were keen to improve the productivity of their land for financial gain. 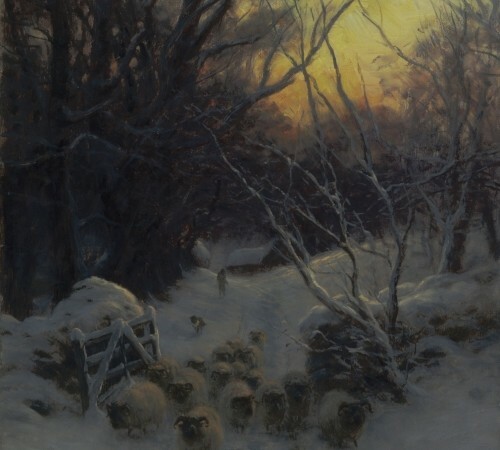 The centrepiece of the exhibition has to be Peter Graham’s 1866 painting A Spate in the Highlands, a staple of Manchester Art Gallery’s permanent collection and, in your reviewer’s opinion, the greatest painting of a Scottish landscape there has ever been, or is ever likely to be. It succeeds because of its scale and frozen-in-time sense of movement: the drover on the collapsing bridge, the sun penetrating the restless cloud cover dappling the mountainside, the rushing peat-brown river that threatens to spill out of the picture frame. It’s little wonder the painting was such a spectacular hit when first exhibited at the Royal Academy and that Graham found it impossible to repeat this success; though his The Sea Birds’ Domain, also exhibited here, is a captivating and impressive seascape scene, and a very fine painting indeed. Edwin Landseer’s On the Tilt, Perthshire is, by comparison, a much smaller affair. 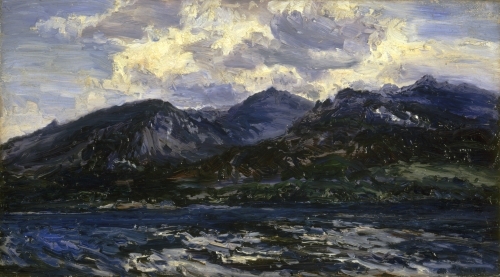 Landseer, one of the great British painters (and, like Wordsworth, one of the most appropriately named masters of his profession), would often escape to his Highland hideaway in Glenfeshie and sketch the landscape. Here we have a very charming oil on millboard painting of a section of the River Tilt which testifies to the artist’s appreciation of the raw beauty of the Scottish landscape. Landseer drew this for no reason other than for the pleasure of drawing it. One of the most charming paintings is Henry Liverseege’s Sir Piercie Shafton and Mysie Happer, depicting a scene from Scott’s novel The Monastery where Sir Piercie, an English knight, encounters Mysie, the beautiful miller’s daughter. It’s a confidently executed painting which captures the worldly Sir Piercie in full seduction mode, while the lowered eyelids of the platter-bearing Mysie suggest a demure reciprocity. The painting was exhibited in 1831 at the Royal Academy and purchased by the 6th Duke of Devonshire. Liverseege, a Mancunian artist, died young at the age of 29 and was often referred to in his day as ‘The English Wilkie’ after the Scottish artist David Wilkie. In fact, Liverseege’s paintings appear more impulsive and less-refined than Wilkie’s, indicative of a more naturalistic and expansive talent. It is generally agreed that he was a highly-gifted artist. Perhaps the exhibition would not be complete without Millais’s Autumn Leaves, another staple of Manchester’s permanent collection. It’s an unusual painting and the meaning remains unclear. 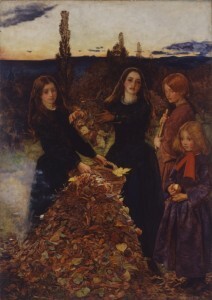 The young girls, stood in a garden beside a pile of autumn leaves in the Perthshire dusk, are typically beautiful (Millais excelled in painting female beauty) but their features are pensive beyond their years, as if they fully comprehend that falling leaves mark a passing of time, and that the autumn of their lives, though far-distant, will come. This is a small though highly thought-provoking and enjoyable exhibition which, through the careful selection of exhibits on display, provides a colourful and at times dramatic narrative of Scotland as seen through the highly perceptive and romantic filter of the Victorian mind.